Simon, Jane and Barney, enlisted by their mysterious great uncle, arrive in a small coastal town to help recover a priceless golden grail stolen by the forces of evil, the Dark. 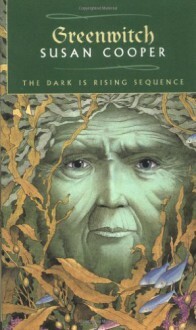 They are not at first aware of the strange powers of another boy brought to help, Will Stanton-- nor of the sinister significance of the Greenwitch, an image of leaves and branches that for centuries has been cast into the sea for good luck in fishing and harvest. Their search for the grail sets into motion a series of disturbing, sometimes dangerous events that, at their climax, bring forth a gift that, for a time at least, will keep the Dark from rising. I remember being rather frightened by one part of this book when I read it the first time. And overall the whole book had a more sinister-feeling tone that disturbed me. I don't feel that way as an adult (thankfully!) and think I actually appreciate it more with age.